Mummar (Moammar) Gadhafi's (Gaddafi's) face was virtually always in a state of Contempt. Contempt is a very specific emotional state wherein you place yourself above another person or group of people. More than almost any public figure - Gadhafi's face and mind were locked in this emotion. In this image, you can see a moderate example (perhaps a 4, on a 1-to-10 scale) of contempt. Mild mid-face tightening is easily visible and very subtle nostril dilation is present. What is more obvious though - and classic for contempt - is the unilateral lip-mouth elevation, which incredible as it may seem, is often mistaken for a subtle smile. An alarm should always go off when you see a "one-sided smile" - for it is never sincere. What many people miss is Gadhafi's head retraction - a pulling back of his head - which gives this "triple chin appearance" (it certainly may be less obvious than this however). 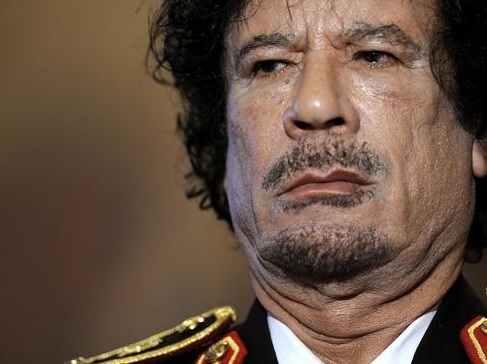 Gadhafi's eyebrows are also pulled inward and down - a manifestation of contempt's common co-conspirator - anger.